The Cartoonist has taken advantage of ambiguous art to create multiple comic strips. An airplane on a runway. Voice: Sorry for keeping you here for ten hours before take-off. We were trying to. . . Interior of airplane with passengers in seats. Voice: . . .catch a rat that was running around the airplane. Flight attendant, with moving object in hand: But we found it! We're about to take off now. Voice: Enjoy our free high-speed Wi-Fi Internet service after take-off. 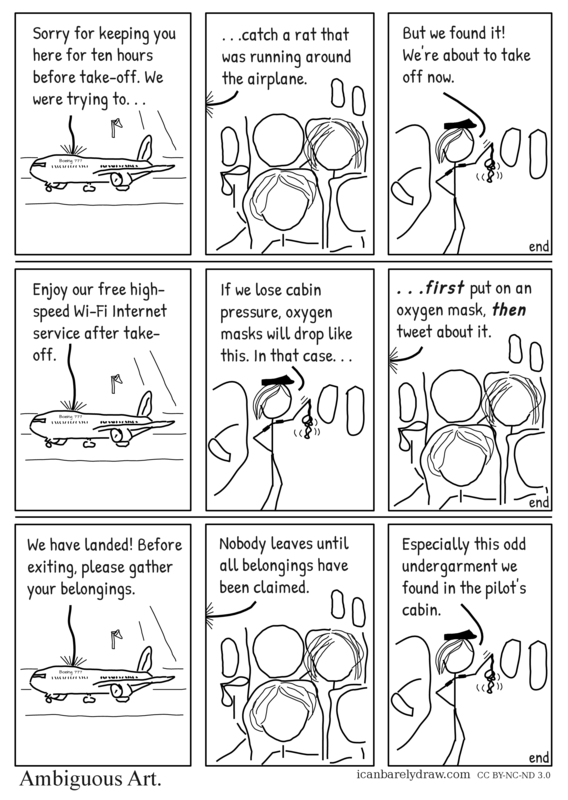 Flight attendant, with moving object in hand: If we lose cabin pressure, oxygen masks will drop like this. In that case. . .
Voice: . . .first put on an oxygen mask, then tweet about it. Voice: We have landed! Before exiting, please gather your belongings. Voice: Nobody leaves until all belongings have been claimed. Flight attendant, with moving object in hand: Especially this odd undergarment we found in the pilot's cabin.